The death of the shuttle, the moon hoax conspiracy theory, and why one man deserved to be punched in the damn mouth by Buzz Aldrin. The following is an excerpt from Leaving Orbit by Margaret Dean Lazarus, winner of the Graywolf Press Nonfiction Prize, appearing courtesy of Graywolf Press. The astronauts walked with the easy saunter of athletes. . . . Once they sat down, however, the mood shifted. Now they were there to answer questions about a phenomenon which even ten years ago would have been considered material unfit for serious discussion. Grown men, perfectly normal-looking, were now going to talk about their trip to the moon. It made everyone uncomfortable. Maybe you’ve seen it. Many people have—at least 800,000 have clicked on various YouTube iterations of the same moment. It looks like nothing at first. The video is fuzzy, amateur, handheld. We hear the muffled verité sound of wind against the microphone, of the excited breath of the camera operator. People are standing around, their postures reflecting boredom, their faces and movements obscured by the shaky camera work and low resolution. On YouTube, of course, this poor video quality, combined with a high hit count, contains an inverse promise: something is about to happen. We can make out a white-haired man in a blue blazer, partially obscured by a sign. He seems to be talking to another man, in a black jacket, whose back is to the camera. Out of any context, the white-haired man would be unrecognizable because of the bad video quality, but if you know to look for him—and you do, because of the title on the YouTube page—the man is recognizable as astronaut Buzz Aldrin, lunar module pilot of Apollo 11, one of the first two men to walk on the moon. The muffled audio obscures the voice of the black-jacketed man, who is speaking now. Passion or nervousness makes his voice waver. “You’re the one who said you walked on the moon when you didn’t,” the man says. He is holding an object out to Buzz. A subsequent Google search reveals that it’s a Bible—he is trying to make Buzz swear upon it. man in the jaw. Even with the poor video, we can see that it’s an impressive punch, well-aimed and powerful. We can’t see the punched man’s face, but we see his head recoil backward. The camera recoils too, as if in sympathy. Something has changed in the scene, you can sense it. One public figure’s image has been complicated, another person now has a story to tell, a video to put on YouTube. “Did you get that on camera?” the man in the black jacket asks breathlessly, a note of joy in his voice. The black-jacketed man is Bart Sibrel, moon hoax conspiracist. He believes that all of the trips to the moon were faked, were in fact physically impossible, and that the Apollo astronauts have agreed to uphold the lie because they benefit personally and financially. (He has also stated at other times that the astronauts are not consciously lying but were subjected to mind control by the government to convince them that they did in fact go to the moon. Today, clearly, he is working from the former theory.) He has made it his life’s work to expose the conspiracy. “Did you get that on camera?” This line of dialogue, spoken so clearly and happily, subsequently helps to acquit Buzz Aldrin, seventy-two years old at the time of the incident, of assault charges. 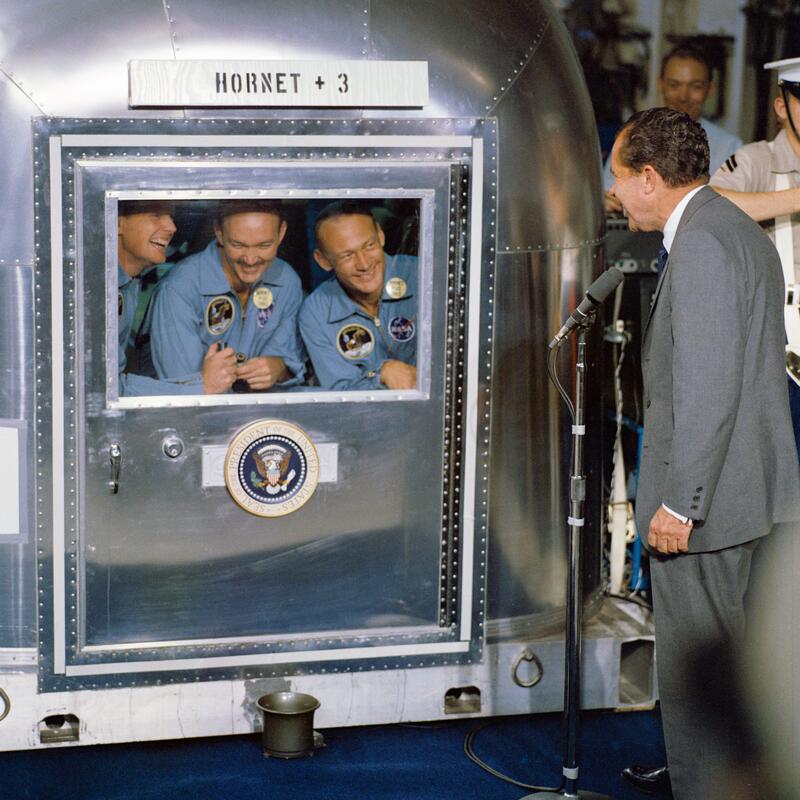 Everyone agrees that NASA’s finest hour was the journey of Apollo 11, which left Earth with Buzz Aldrin, Neil Armstrong, and Michael Collins aboard on July 16, 1969. During the three days it took them to get to the moon, the astronauts grew beards, took measurements of the stars out their windows using sextants to make sure they were still on course, chatted with Houston, listened to music on tape, shot films of each other doing somersaults and making ham sandwiches in microgravity, got mildly on one another’s nerves, and refrained from considering the enormity of their undertaking. Each of them has said in the years since that they actively kept themselves from thinking about the long chain of risky events it would take to get them back home. This particular avoidance was an ability they had honed as test pilots of experimental aircraft. It seems desirable for astronauts to be able to resist grand and potentially panic-inducing trains of thought, yet all three of them have expressed regret that this same character trait kept them from being able to adequately convey to us spectators what it was like to experience the things they experienced. It’s difficult for those of us born in a later era to imagine the historical phenomenon of Apollo, a moment when Americans came together over an enormous science project funded entirely by the federal government. We must take our elders at their word when they talk about what this was like, as we’ve never seen such a thing ourselves. Some years, during the run-up to Apollo, Congress voted to allocate NASA a larger budget than NASA had requested. The effects of this kind of public support were unprecedented outside of war, and may never be seen again. As important as this financial support was for the early days of Apollo, it also created a tragically inaccurate impression within NASA that its projects would continue to be funded at this rate. In the mid-sixties, everyone thought the construction of the Kennedy Space Center was taking place at the start of an exciting new era. No one could have known that in fact 1966 was to represent the zenith of that unanimity. The public’s imagination for fulfilling President Kennedy’s challenge would prove more shortsighted than anyone at NASA had hoped. Space historians divide the fifty-year period of American spaceflight into two eras: the “heroic era,” which includes the Mercury project to put the first Americans into space, the Gemini project to expand NASA’s abilities and test techniques for getting to the moon, and the Apollo project, which achieved the moon landings. The second era of American spaceflight is known as the “shuttle era,” and its being named for a vehicle rather than a lofty attribute says a lot about the difference between the two, about the loss of grandiosity in the goals we set ourselves, about the ways in which NASA had been forced to repackage spaceflight as an economical and utilitarian project. The heroic era spanned only eleven years (1961–72) compared to the shuttle’s thirty, with a much longer list of firsts, and this fact contains an important lesson about the history of American spaceflight as well. We did a lot in a very short span of time, and then we did a lot less for a lot longer. Soon, of course, we’ll be doing nothing at all. Faced with the fact that we are losing American spaceflight altogether, suddenly the workhorse shuttle seems as beautiful and daring as the Saturn V did in the sixties. It’s the shuttle’s disasters that brought about its end. We want the danger, but without any actual risk. This is the paradox of growing up in the shuttle era: the vehicle is more complex and advanced, its reusability makes it much more cost-effective, and its versatility makes possible missions the Saturn V never could have accomplished, such as repairs to the Hubble Space Telescope and construction of the International Space Station. Yet the sense of danger, the sense of achieving the impossible, was what made the heroic era feel heroic. If we could somehow get that back, many people feel, we could restore NASA to what it once was. The sense of collective adventure from the heroic era has never left us. At the same time, it’s the shuttle’s disasters that brought about its end. We want the danger, but without any actual risk. Here is one way to conceptualize NASA’s heroic era: in 1961, Kennedy gave his “moon speech” to Congress, charging them to put an American on the moon “before the decade is out.” In the eight years that unspooled between Kennedy’s speech and Neil Armstrong’s historic first bootprint, NASA, a newborn government agency, established sites and campuses in Texas, Florida, Alabama, California, Ohio, Maryland, Mississippi, Virginia, and the District of Columbia; awarded multi-million-dollar contracts and hired four hundred thousand workers; built a fully functioning moon port in a formerly uninhabited swamp; designed and constructed a moonfaring rocket, spacecraft, lunar lander, and space suits; sent astronauts repeatedly into orbit, where they ventured out of their spacecraft on umbilical tethers and practiced rendezvous techniques; sent astronauts to orbit the moon, where they mapped out the best landing sites; all culminating in the final, triumphant moment when they sent Neil Armstrong and Buzz Aldrin to step out of their lunar module and bounce about on the moon, perfectly safe within their space suits. All of this, start to finish, was accomplished in those eight years. I have read many detailed accounts of how this happened from scientific, engineering, and political standpoints. What it means that all this happened—what it means that it couldn’t happen again—is yet to be written. The astronauts did well not to linger too much on the meaning of their undertaking, because the number of steps it would take to complete the mission was daunting. As command module pilot Michael Collins put it, “The press always asked what part of the upcoming flight would be the most dangerous, and I always answered, that part which we had overlooked in our preparations.” In his memoir of the journey, Collins lists the eleven points in Apollo 11’s flight plan that “merited special attention”: (1) leave Earth’s surface under the power of the world’s largest rocket and attain Earth orbit; (2) burn the engines to set course for the moon and spend three days traveling a quarter million miles; (3) separate the lunar module and remate it with the command module; (4) achieve lunar orbit; (5) separate the lunar module (carrying Neil Armstrong and Buzz Aldrin) from the command module (now carrying only Michael Collins, who, while he was on the far side of the moon, set a record for being the farthest a human has been from any other); (6) land the lunar module safely on the moon; (7) put on space suits, open the hatch, and climb down the ladder to step onto an alien planetary body, gather moon rocks, plant a flag, conduct a few experiments, talk to the president, pose for pictures, climb back into the lunar module; (8) burn the engine to leave the moon’s surface; (9) rendezvous with the command module in lunar orbit (which is to say, line up the two spacecraft and remate them, easier said than done when the two spacecraft are traveling at different speeds in different orbits); (10) ditch the lunar module and burn the engines again to set course for Earth; (11) survive the heat of reentry and hope the chutes deploy properly, allowing the capsule to splash down into the Pacific, from which the astronauts will be fished out by a helicopter rescue crew from a nearby aircraft carrier. Different people give different estimates of the odds involved, but Michael Collins privately gave the whole chain only about a fifty-fifty chance of success. 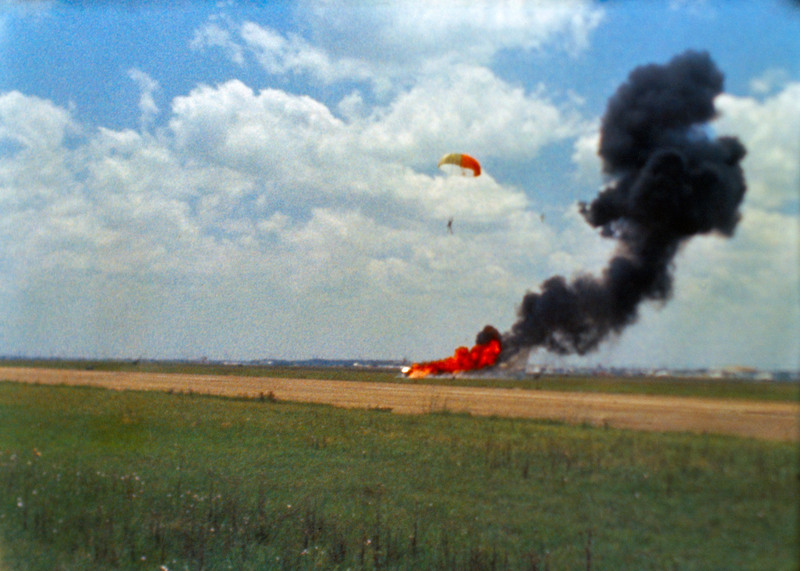 A failure at any one point would mean failure of the mission, and most would also mean the deaths of at least two, maybe all three, crew members. (Wernher von Braun told Oriana Fallaci that “fifty percent of the risk is that before they set off they’ll die in a car crash here on Earth: they drive like madmen. The other fifty percent is that they’ll die going to the Moon.”) Many of these steps had never been attempted before, and some of them could not be properly tested on Earth. By far the riskiest step in the sequence was (8): burn the lunar module’s ascent engine to leave the moon’s surface. This step simply had to work, or Neil and Buzz would be left to die there. But designing an engine to ignite in a vacuum in one-sixth Earth’s gravity was at best a series of educated guesses. The lunar module, on its own going by the call name Eagle, undocked from the command module, now called Columbia, leaving Michael Collins behind, on July 20, 1969. Eagle’s descent toward the surface of the moon was not without incident: multiple computer alarms went off and the data screens went blank during the riskiest part of descent, with only sixty seconds of fuel left; neither Neil nor Buzz had ever seen these particular alarm codes in their training simulations. A twenty-six-year-old computer engineer in Mission Control in Houston had a fraction of a second to choose whether to call out “no-go” or “go”—whether to abort the mission and send Eagle back up to redock with the command module, losing the chance to land on the moon, or whether to continue. “Go,” the engineer said into his microphone. “Go,” repeated Mission Control to Neil and Buzz, “we are go.” In fact, none of them had any way of knowing whether the computer error might prevent Eagle from lifting off properly when it was time to rendezvous with Columbia, and the possibility weighed on them all for the next two days. The Apollo computer was one of the many components that simply had to work or the astronauts would die; its total memory was smaller than the file size of a song I just downloaded on my phone. Neil Armstrong climbed out the hatch and set his boot onto the surface of the Sea of Tranquility at 10:56 p.m. Eastern Daylight Time on July 20, 1969. Some people suspect that NASA hired a team of copywriters, or poets, to come up with the historic first words to utter along with his first step, but in fact no one told him what to say or even asked what he would say, if all accounts are accurate. “That’s one small step for a man . . . one giant leap for mankind.” We’ve grown so used to this sentence, we don’t even really hear it anymore. In fact, I grew up with a mishearing of it (“one small step for man”) that renders the words senseless. It turns out that a quirk of Armstrong’s regional accent led to the confusion—among Ohioans, “for a man” can come out “fra man,” and the indefinite article was lost. But even with the misunderstanding, the line still rings in schoolchildren’s ears. I am on the moon. This is all happening, right now, on the surface of the moon. If someone asked to me to sum up what is great about my country, I would probably tell them about Apollo 11, about the four hundred thousand people who worked to make the impossible come true within eight years, about how it changed me to see the space-scarred Columbia capsule in a museum as a child, about how we came in peace for all mankind. Yet I feel the built-in pointlessness at the heart of Apollo as much as I fiercely admire it—it’s the same pointlessness shared by any artistic gesture. I feel it most at that moment when Neil and Buzz have stepped off the ladder, taken their bearings, picked up a few moon rocks, photographed the scene, and looked around them. A weird thought hovers over their helmets in the bright sunlit vacuum. What now? It’s a peculiar feeling, after the unspeakable effort and expense. None of the answers are entirely satisfying. I’m watching the YouTube clip of the Punch because I’ve just confirmed that I’m going to meet Buzz Aldrin. I’m going to spend most of a day with him, actually. We will both be at the Southern Festival of Books, held each October in Nashville. Buzz is in the middle of a huge book tour behind his autobiography, whose release has been timed to coincide with the fortieth anniversary of Apollo 11. I had committed to being at the festival long before, to talk about my Challenger novel, and the organizers had quickly figured out that I would be the only other writer at the festival with much knowledge about spaceflight. After I agreed to give Buzz’s introduction (which, I was told many times and in no uncertain terms, could absolutely not go over two minutes), I began to panic. 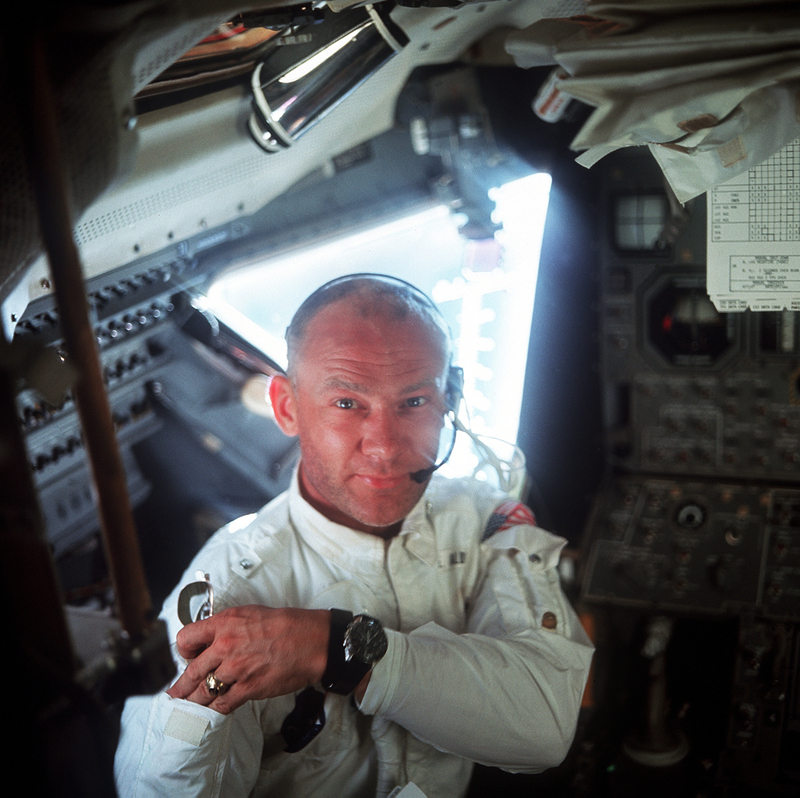 What does one say about Buzz Aldrin in under two minutes? I looked back through everything I’d learned about his accomplishments—my books about Apollo, my copies of Buzz’s previous autobiography and his forays into science fiction, Michael Collins’s memoir and Neil Armstrong’s biography, the many documentaries and interviews in which Buzz has participated. I could write a book about him if I were asked; it was harder to sum up everything about him in one hundred twenty seconds. I imagined standing up in front of a packed auditorium and telling the crowd, “You guys, you know the greatest achievement of humankind? Okay, this guy? Right here? He did that.” Point dramatically at Buzz, take my seat. Well under two minutes. Buzz Aldrin was among the third group of astronauts, chosen in 1963. Those early astronauts, crew-cut Caucasian men, family men, military men, all seemed immune to the emotion of what they were doing. They never waggled their heads at the wonder of it all. There are no reports of them tearing up upon entering the Vehicle Assembly Building. They quickly changed the subject when they were asked about the possibility of their deaths, and politely filibustered questions about God and the heavens. This was what was expected of them, of course—this calm in the face of danger. This is what Tom Wolfe found remarkable about them. Their ability to step onto unstable rockets, to take perilous risks seemingly without fear, their ability to carry out the greatest achievements of their species without raising their heart rates or losing their swagger. This was exactly why they had been chosen as test pilots and then as astronauts. Yet—and here was the contradiction—people wanted to see emotion from them. I knew that before being selected as an astronaut Buzz Aldrin earned a PhD in astronautics at MIT, where he designed orbital rendezvous techniques for spaceships docking in orbit (still a highly theoretical prospect in 1963). According to all reports, this was a project that required a freakish level of intelligence, a mind-spinning application of physics, intersecting multiple orbits that young Buzz, in that time before computers, calculated by hand with a slide rule. (His fellow Apollo astronauts also recall that he was unique among them in his ability to calculate orbital rendezvous in his head.) The techniques he created were critical to early spaceflight, and some of them continue to be used today. Out of curiosity I decided to get hold of Buzz’s 1963 PhD dissertation through my father, whose status as an MIT alumnus allowed him to download a copy from the MIT library site. The dissertation is titled “Line-of-Sight Guidance Techniques for Manned Orbital Rendezvous.” Hand-typed, the equations make me imagine Buzz (or maybe it was his wife, Joan) painstakingly rolling the platen up or down half a click to create superscript and subscript numbers, dozens of them per page. The abstract introduces the project as a study of “the inertial rotation of the line of sight throughout three dimensional Keplerian rendezvous trajectories.” A whole page reads like this— words I don’t know, or words I thought I knew that are clearly being used in an extremely specific way. In the hopes that this work may in some way contribute to their exploration of space, this is dedicated to the crew members of this country’s present and future manned space programs. If only I could join them in their exciting endeavors! I feel a surge of happiness. Here is my reward: Buzz Aldrin has, unwittingly, dedicated his dissertation to himself. It’s hard to say precisely when the first moon hoax theory emerged, and harder still to say when it picked up steam. Maybe there were always people who doubted, even in the moment, even as the images were playing in black and white in their living rooms. Maybe some people’s trust in government had already eroded that much—maybe in certain circles it was starting to be a more fashionable stance to question everything. What we do know is that by the thirty-year anniversary of Apollo 11, in 1999, about 6 percent of Americans told Gallup they believed the moon landings were staged and another 5 percent said they had no opinion, leaving only 89 percent who firmly believed we went to the moon. Things were worse by 2004, when a survey of people eighteen to twenty-five years old revealed that 27 percent of them “expressed some doubt that NASA went to the Moon,” with 10 percent of them indicating that it was “highly unlikely” that a moon landing had ever taken place. No one from NASA Public Affairs has ever undertaken to answer the hoax charges in a systematic way. The only rebuttal to appear anywhere on the nasa.gov domain is from the Science and Technology Directorate at NASA’s Marshall Space Flight Center and dates from 2001, shortly after Fox aired a special called Conspiracy Theory: Did We Land on the Moon? You can see why there wasn’t a larger, more official response from within NASA—to do so would be to engage in, and thereby dignify, an argument that should not be mistaken for an actual controversy. I have met moon hoax True Believers in my daily life, and while many of them are precisely the sorts of libertarians and X-Files fans you would expect to relish such a juicy conspiracy, I’ve often been surprised by stealth conspiracists, the non-paranoid-appearing, buttoned-up types whom you wouldn’t expect to question much of anything. They smirk at me condescendingly, shake their heads a couple of times, and explain to me why we couldn’t have done it. Couldn’t have. If they seem open to discussion, I have a couple of key pieces of counterevidence I like to offer. One I like to repeat is from Michael Collins: over four hundred thousand people worked on Apollo at its height, he points out, and not one of them has come forward to spill the secret in the intervening decades. “I don’t know two Americans who have a fantastic secret without one of them blurting it out to the press,” he points out in a documentary interview. “Can you imagine thousands of people able to keep this secret?” The idea that so many people, many of whom would have to be in a position to know of the deception, kept such an incendiary secret for decades strains even the most generous understanding of human nature. My other favorite counterargument draws on evidence that is more empirical. All six missions to land on the moon brought back pounds of moon rocks. These rocks have been made available to scientists, who have studied them using technologies that had not yet been invented during Apollo. Either NASA figured out a way to create fake moon rocks convincing to the molecular level, or the hundreds of scientists from all over the world who have been allowed to study the rocks over the years are in on the conspiracy. Neither seems likely. It seems much more likely that if NASA wanted to fool people with a fake moon landing, their first order of business would be to come up with a plausible reason why the spacecraft couldn’t carry back any rocks. There is a pleasure in doubting. But none of my counterevidence will make much difference, I know. There is a pleasure in doubting. I’ve felt it too, about other things: a satisfaction at being smarter than those who have been duped, a satisfaction at being ungullible. I once met another Apollo astronaut, Jack Schmitt, a geologist and the first scientist to travel in space. I told him that his name is in my novel—my main character was born in 1972, the same day Schmitt and his crewmate Gene Cernan fired their lunar module’s ascent stage and lifted off the surface of the moon for the last time. I asked him what he says to moon hoax conspiracists. It’s the condescension in the conspiracist’s smirk that drives me insane. The smirk makes me a credulous dupe, one of the clamoring naive who believes the bedtime story. The conspiracists want to erase from the official record the achievement that some call the greatest achievement of the United States, the greatest achievement of the twentieth century, the greatest achievement in the history of humankind. The rage this elicits in me (a tiny flame, entirely controllable in social situations, yet rage is the word for it nonetheless) is hard to describe. It is a patriotic rage, on behalf of forces much larger than myself, people much greater than myself. The doubters are calling people I admire liars, men who risked their lives for their country before they risked their lives for the exploration of space. Buzz Aldrin a liar, Neil Armstrong a liar, Michael Collins a liar. And the worst kind of liars—those who would manipulate our highest values for their own personal gain. It makes more sense to the doubters that NASA is an organization of frauds and opportunists than that a government agency achieved something beautiful and important, and this angers me on behalf of both the past and the future. I’ve talked to people, friends and strangers, about what it means that the shuttle era is ending, and I’m both heartened by the sadness people seem to feel over its loss and frustrated by the general ignorance about spaceflight and its costs. People tell me that the shuttle program is being sacrificed so the money can be diverted to wars in Iraq and Afghanistan, that the shuttles had to be retired because they have flown more missions than they were designed for, that we are stepping aside as leaders in space in order to create a “more egalitarian” position in the world as part of our president’s general move toward socialism. None of these claims have any truth to them. “Why are we stopping then?” people ask me. I’m always a little more flummoxed by this question than I should be, given how much time I’ve spent reading and thinking about it. It’s complicated, I say. The loss of Columbia was the beginning of the end—that much is true no matter whom you ask. After that disaster, politicians in Washington would have had to spend a lot of political capital to save the shuttle, and a recession would be an especially treacherous time to do that. All this sounds weaker than what I really want to say, though, which is partly that the public’s own apathy is to blame. It’s closest to the truth to say that the fundamental problem is that most people had not really noticed that we were still flying in the first place. I watch the video of the Punch that night after my family is asleep, over and over, trying to get some feeling for the man. But we are not ourselves at our most extreme—not in a moment of rage at being called a coward, not in the moment of the utmost courage, guiding an untested spacecraft down, down, down toward the surface of a desolate alien world while the alarms blare and the fuel runs low. I know only that I don’t yet know Buzz Aldrin at all.